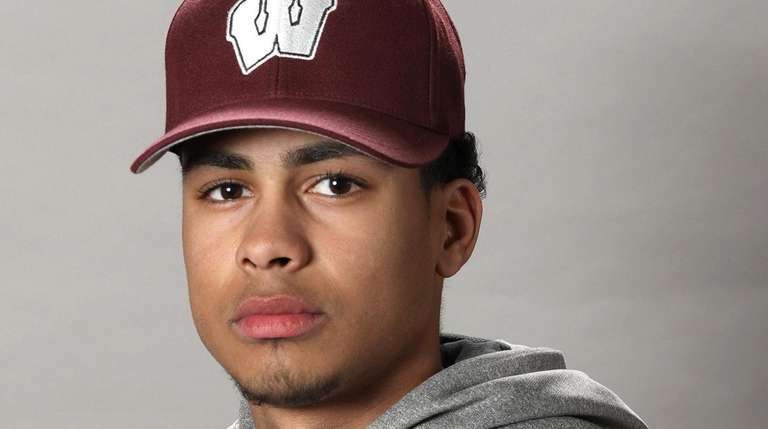 A look at the top 100 high school baseball players on Long Island for the 2019 season, listed in alphabetical order. Randall Alejo, Patchogue-Medford, RHP, Sr. Struck out 38 in 35 innings and hit .350 with 22 hits in 20 games as a junior. 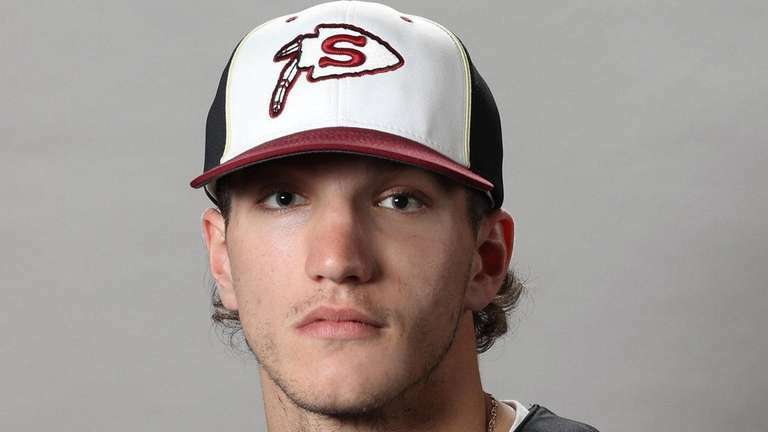 Matt Alifano, Center Moriches, SS/RHP, Sr.
Batted .414 with three doubles, 21 RBIs and 22 runs scored. Committed to Adelphi. Will Allen, Manhasset, 1B/RHP, Sr. He batted .396 with two home runs, 11 RBIs and eight runs as a junior. Leo Alvarez, Oceanside, LF/RHP, Sr. He batted .461 with 27 RBIs and 29 runs scored last season. Christian Amoruso, Smithtown West, CF/RHP, Sr.
Hit .302 with three homers and 15 steals last season and had a 0.00 ERA as a closer. Committed to Lincoln Memorial University. David Aufiero, North Shore, P/SS, Sr. He went 7-1 with a 1.14 ERA and 67 strikeouts in 49 innings as a junior. Committed to Sacred Heart. Jason Barry, Hewlett, SS/RHP, Sr. He batted .340 with 17 RBIs and 17 runs, and had two wins, three saves and a 2.13 ERA as a junior. Justin Bestlerk, Mineola, P/1B, Sr. He batted .365 last season. He went 5-1 with a 1.62 ERA and 41 strikeouts in 39 innings. Andrew Bianco, Kings Park, 1B, Jr.
Big man hit .288 with 11 RBIs. Robert Bradley, Division, RHP, Sr. He went 7-2 with 48 strikeouts, a 0.80 ERA and 0.94 WHIP as a junior. Kevin Bowrosen, Miller Place, IF/RHP, Jr.
Hit .281 with 10 RBIs, 26 runs and 12 steals last season. Matty Brown-Eiring, Connetquot, 3B/RHP, Jr. He batted .348 with 15 RBIs as a sophomore. Committed to Stony Brook University. Nick Burke, North Babylon, INF/ RHP, Sr.
Hit .380 with 16 runs scored as a junior. Will move to the middle infield. Idris Carter, Roosevelt, OF/RHP, Jr. He hit .615 with nine home runs, 39 RBIs and went 4-2 with a 2.93 ERA and 47 strikeouts as a junior. Johnny Castagnozzi, Massapequa, SS, Jr. Always in the middle of a rally, power to all fields. Committed to North Carolina. Alex Chang, Port Washington, P/CF, Sr. He batted .373 last season and went 4-1 with a 3.21 ERA and 62 strikeouts in 37 innings pitched. Stefano Cilluffo, East Rockaway, SS, Sr. He hit .389 with 22 RBIs, 22 runs and 20 stolen bases as a junior. Anthony Cinquemani, West Islip, 1B/RHP, Sr. Drove in the winning run in both games of last year’s Suffolk AA finals. Ezequeil Clase, Whitman, SS, Sr.
Hit .382 with 15 RBIs and six doubles as a junior. Ben Cohen, Bellmore JFK, OF, Sr. He finished second in total hits with 21 for the Cougars as a junior. Charlie Cucchiara, East Meadow, RHP/IF, Sr. 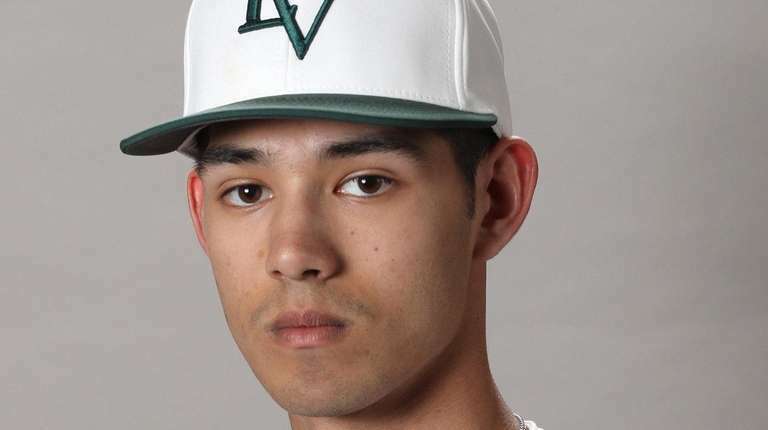 He had five wins with a 1.29 ERA, and 80 strikeouts and five walks on the mound as a junior. Anthony D’Andrea, Calhoun, RHP/3B, Sr. The hard-throwing righty mixes three pitches and pounds the zone. He is a four-year varsity player. Jason Diaz, Kellenberg, RHP/1B, Sr. He recorded 59 strikeouts in 31.2 innings and went 4-2 with a 1.55 ERA for the Firebirds as a junior. Committed to the University of Miami. 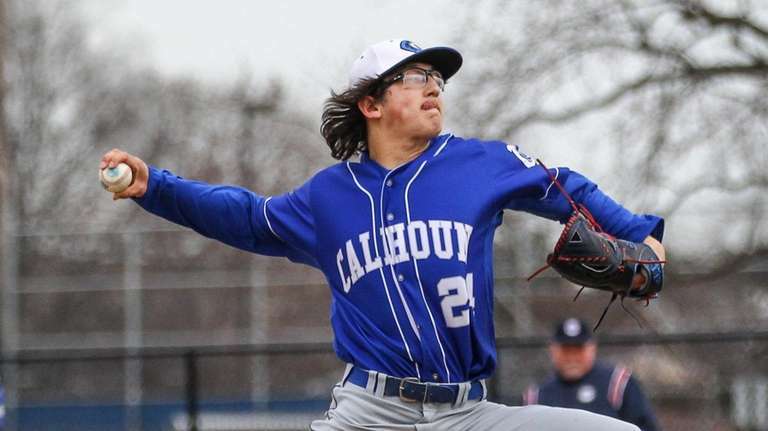 Bobby Dicapua, West Islip, OF/RHP, Jr.
Was 8-1 on the mound as a sophomore with a 1.92 ERA. Roman Dorosh, Sachem East, RHP/CF/ Sr. 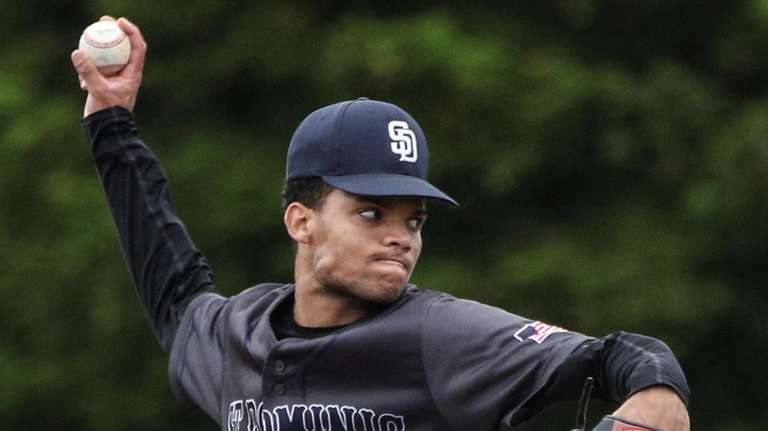 He went 4-1 with 58 strikeouts and a 1.58 ERA as a junior. Committed to Jacksonville. Mike Draskin, Hills West, 3B/C, Sr.
All-Suffolk NYIT commit who batted .470 as a junior. Billy Duff, Garden City, RHP, Sr. He went 5-2 with a 3.19 ERA on the mound as a junior. Matt Encizo, Longwood, OF, Sr.
Hit .449 with 40 hits and 23 RBIs as a junior. Commited to Queens College. Eladio Exposito, St. John the Baptist, SS/RHP, Sr. He batted .280 and had an OBP of .457 for the Cougars. 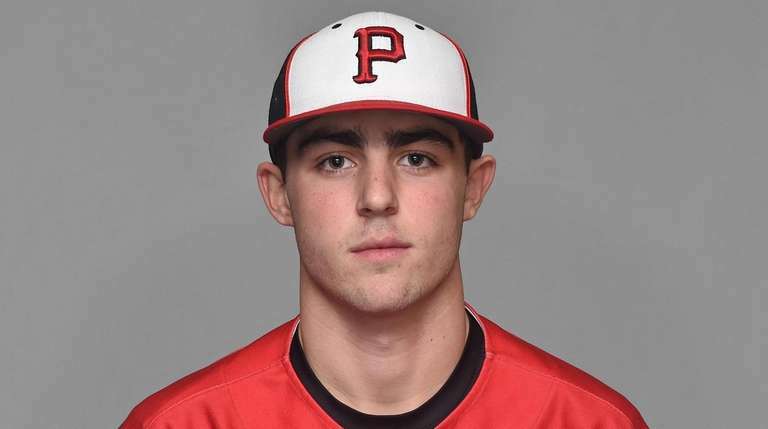 Dave Falco, Center Moriches, 3B/RHP, Sr.
Hard-throwing righty struck out 35 batters in 27 innings, had nine saves and pitched to a 0.51 ERA. Falco also hit 11 doubles, four home runs and had 32 RBIs. Committed to Maryland. Ethan Farino, Ward Melville, RHP/CF, Sr.
Was 3-1 on the mound with a 2.56 ERA and hit .325 as a junior. Theo Farynick, Cold Spring Harbor, SS/RHP, Sr. He hit .375 with three home runs, 18 RBIs and struck out 55 over 35 innings pitched. Brett Figelman, Great Neck South, C, Sr. He hit .529 with 23 RBIs last season. Johnny Flannigan, St. Dominic, OF/RHP, Sr. The 5-10, 180-pound right-hander batted .400 as a junior. 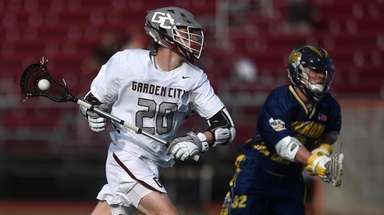 Tommy Fletcher, Oyster Bay, IF, Sr. He hit .490 with six doubles and three triples last season. Tom Gabriele, Southampton, 1B/RHP, Sr. Tops in Suffolk VIII with five homers last season. Nick Gavilla, Hills East, OF/LHP, Sr.
Adelphi-commit hit .379 with 12 RBIs and 22 runs in 2018. Giancarlo Giacometti, St. John the Baptist, IF/RHP, Jr.
Giacometti had a 1.72 ERA in 21 innings and recorded 17 strikeouts as a sophomore. Chris Giardino, Clarke, C/3B, Jr. He had a .330 average as a sophomore and threw out over 50 percent of base stealers. Committed to Molloy. Chandler Giovinco, Newfield, RHP/OF/SS, Sr. Slashed .345/.444/.537 with three homers and 23 RBIs in 2018. Joe Gisonda, Valley Stream North, 2B/SS, Sr. He hit seven home runs and batted .457 with 35 runs scored in 2018. 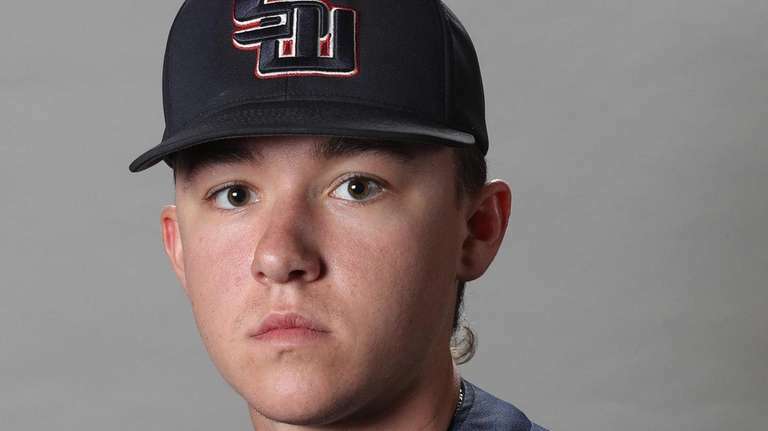 Doug Goodwin, Smithtown East, RHP, Sr.
A three-year starter with 15 wins. Committed to Binghamton. Bryce Grathwohl, Mattituck, RHP/IF, Sr.
Hit .385 with 25 RBIs and 18 runs while going 4-4 with a 1.23 ERA and 52 Ks in 46 IP. 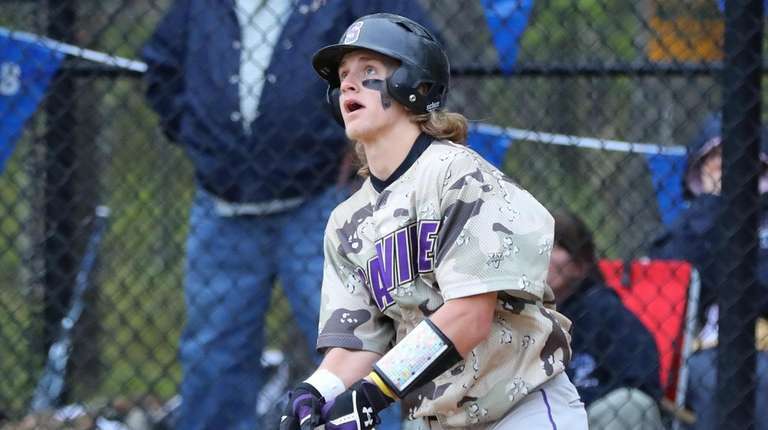 Jack Greco, Harborfields, SS/OF, Jr.
Hit .394, with a .652 slugging percentage, and had 13 extra-base hits last year. 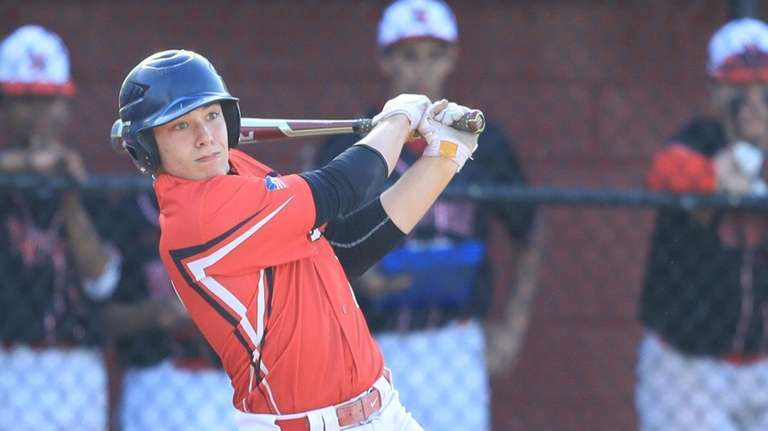 Nick Harvey, Smithtown East, SS/RHP, Sr.
Will play at New Paltz. Carlos Hidalgo, St. Dominic, CF/RHP, Jr. 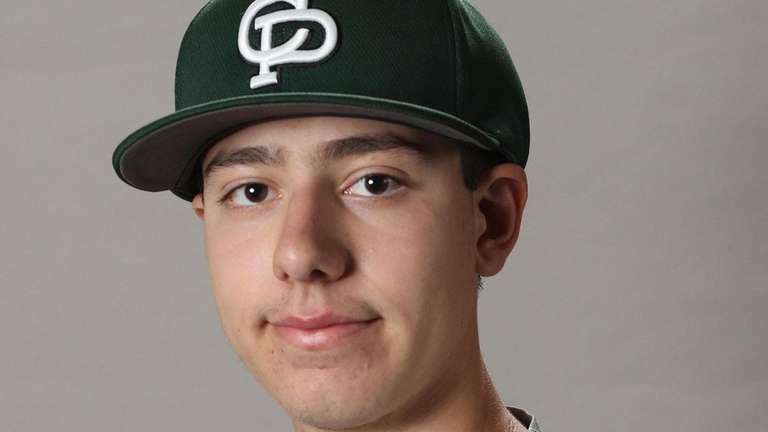 He went 5-1 last season with a 0.83 ERA and was named the CHSAA pitcher of the year. Nick Incalcaterra, Plainedge, RHP, Sr. He went 6-1 with a 1.19 ERA, and struck out 37 batters in 41.1 innings pitched, including a 0.92 WHIP. Danny Kelleher, South Side, OF/RHP, Jr. He struck out 26 batters over 24 innings with a 1.34 WHIP last season. 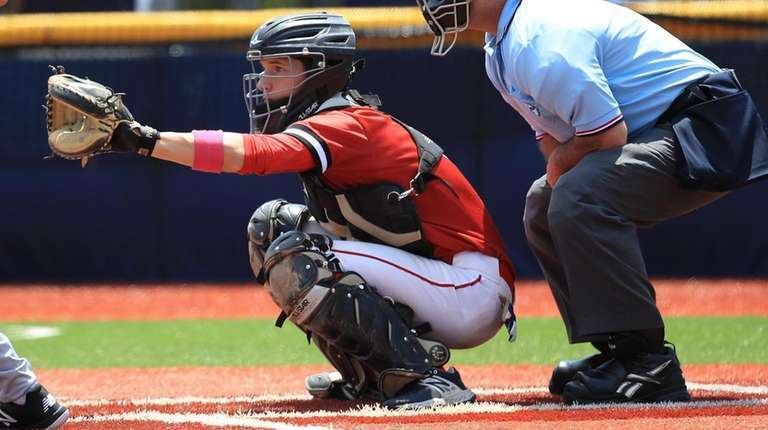 Will Kennedy, Smithtown East, LHP/1B, Sr.
Dual threat All-Suffolk selection hit .447 last season. Committed to Hofstra. Aaron Klug, Port Washington, SS, Sr. He hit .397 with 19 RBI as a junior. Logan Koester, Chaminade, RHP, Sr.
He’s a hard throwing 6-4 righty, who pounds the zone with a three-pitch repertoire, including an 89-90 mph fastball. Committed to George Washington. Ben Kovel, Calhoun, RHP/DH, Sr.
A four-year varsity player with an excellent three-pitch mix. Committed to Fordham. 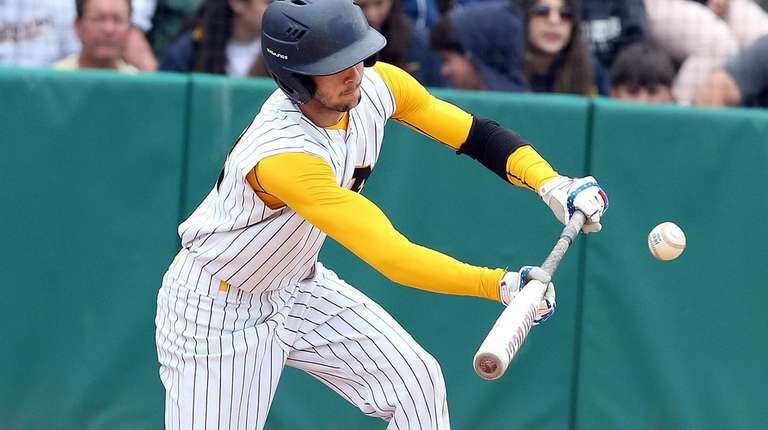 Jake Krzemienski, Commack, LHP/1B, Sr.
Hit .400 with two home runs and pitched to a 7-1 record. Committed to Boston College. 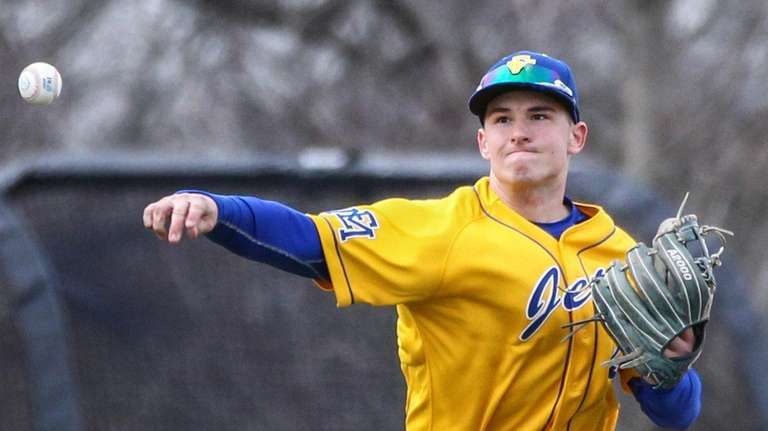 Mike Ladonna, West Islip, IF/RHP, Sr.
Hit .405 with 27 RBIs and was 7-1 with a 1.90 ERA. Committed to NYIT. Aidan Larkin, Chaminade, SS, Sr.
Jake Lazzaro, Oceanside, SS, Sr. He hit .412 with 34 runs, 13 RBIs and 22 stolen bases in 2018. Cam Leary, St. Anthony’s, CF, Jr. He blasted five home runs, drove in 21 runs and hit .330 last season. Committed to Boston College. Chris Leary, Floral Park, SS/3B/RHP, Sr. He had a .385 OBP with three wins and two saves over 50 innings pitched last season. Frank Letterese, Sachem North, OF, Sr. He hit .367 with a .433 on-base percentage. Ryan Levenberg, Hauppauge, LHP, Jr.
Won three games and struck out 32 as a sophomore. Also had 19 hits, including five doubles. Committed to Hofstra. Matt Lewin, North Shore, CF, Sr. He batted .362 with 22 runs scored, 12 stolen bases and 2 home runs as a junior. Committed to Bard College. Dan Livoti, North Shore, C/RHP, Sr. He batted .344 with two home runs and 16 RBIs as a junior. Nick Lomonaco, Floyd, CF, Sr.
Hit .345 last season and stole 14 of 16 bases. Committed to Eastern Tennessee State. 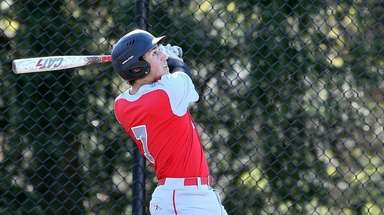 Alec Maag, Center Moriches, C/DH, Sr.
Hit .431 with five doubles, four home runs and 25 RBIs. 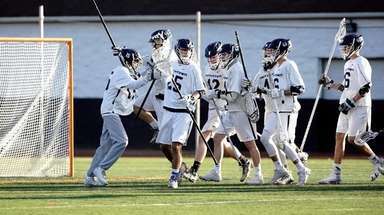 Committed to Eastern Connecticut State. 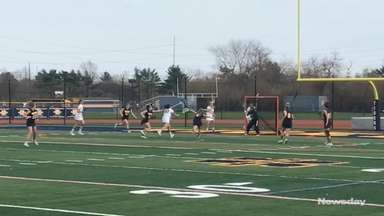 Gionni Maccio, Mepham, OF, Sr. He batted .467 with 17 RBIs and eight stolen bases as a junior. Chris Manzi, Valley Stream North, RHP/LF/1B, Sr. He went 4-1 with a 1.90 ERA and 38 strikeouts in 29 innings pitched last season. Jose Matos, Longwood, SS/C, Sr.
Hit .337 with 21 RBIs last season. Committed to Adelphi. Max Nielsen, Ward Melville, LHP/DH, Sr.
Was 5-1 with a 1.89 ERA and hit .357. Committed to UConn. Cameron Mayer, Syosset, RHP, Sr. He struck out 38 batters and had a 2.77 ERA in 2018. Committed to Tufts. Tim McHugh, Commack, CF, Sr.
Hit. 490 with five home runs, 27 RBIs, and stole 12 bases in 12 attempts. Committed to TCU. Mason McLane, Wantagh, SS/RHP, Sr. He is the only returning starter and will be a shortstop/pitcher this season. Rob Milopsky, Rocky Point, 3B/RHP, Sr.
Hit .297 with three homers and 13 RBIs and went 7-1 with a 1.95 ERA. Brock Murtha, Sayville, SS/RHP, Jr. He struck out 61 in 47 innings and had a 2.12 ERA. Committed to Notre Dame. Luke Napolitano, Kellenberg, SS, Sr. The senior is a smooth fielding shortstop and has power to all fields. Committed to Kansas. 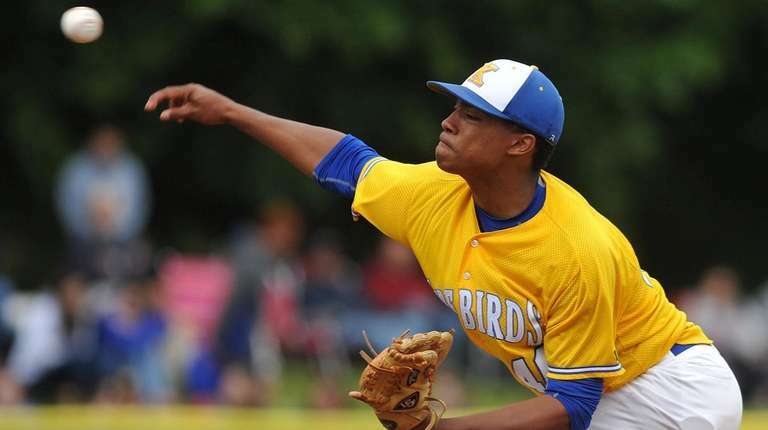 Chris Palmer, East Islip, RHP/DH/ Sr.
Had an 8-1 record with a 1.40 ERA as a junior. Nick Papageorge, Wheatley, RHP/IF, Jr. The closer struck out 45 batters over 27 innings with a 0.77 ERA and batted .492 with six home runs and 32 RBIs last season. Brian Primm, North Babylon, 1B/RHP, Sr.
He’s a sure thing at first base, committing one error in 243 chances over two seasons. Steve Proko, Locust Valley, RHP/CF, Sr. He hit .373 last season with a 2.84 ERA and is committed to Adelphi. Kyle Rausch, Longwood, CF, Sr. He batted .405 with 14 RBI as a junior. Commited to Navy. Jack Riordan, Commack, SS, Jr.
Hit .410 as a sophomore as the starting shortstop for St. Anthony’s. Tommy Reifler, Garden City, SS, Sr. He batted .329 last year with a .485 OBP. Slick fielding shortstop. Committed to Binghamton. Steven Rizzo, St. Anthony’s, RF, Sr. 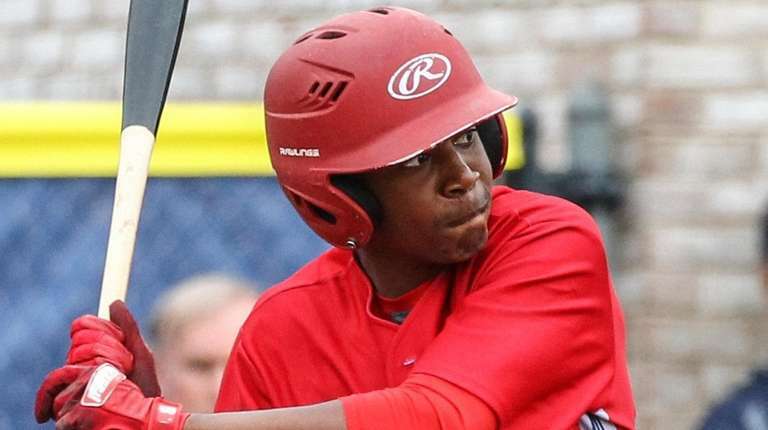 The Franklin and Marshall commit batted .330, stole 20 bases and had 21 RBIs in his junior season. Justin Rosner, Farmingdale, RHP, Jr. He went 5-2 with a 1.89 ERA and struck out 72 batters in 49 innings last season. Tim Saulpaugh, Seaford, SS, Sr. He hit .413 with 26 hits and 18 runs in 2018. Joe Savino, Connetquot, RHP, Sr.
Elon commit had a 0.69 ERA, 64 K, 7 BB in 47 innings in 2018. Garrett Scavelli, Carey, P/CF, Jr.
Scavelli batted .492 with two home runs and 21 RBIs as a junior. Cooper Schiavoni, Pierson, SS/RHP, Sr.
Hit .450 and went 3-2 with two saves on the mound. Jay Schlaefer, Manhasset, RHP/OF, Sr. He batted .321 with 16 runs scored and six stolen bases as a junior. 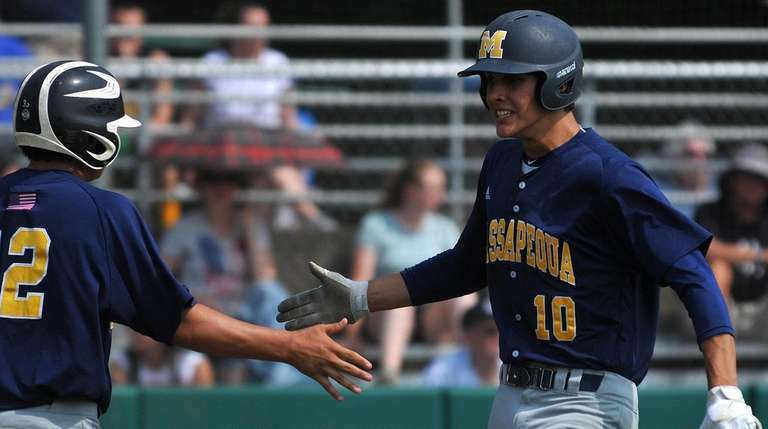 Nick Schwartz, Massapequa, C, Sr. Three-year starter, who hit. 385 with a few game-winning hits. Committed to St. John’s. Aidan Tornquist, Hills West, RHP/OF, Sr.
Fordham-commit and All-Suffolk selection held a 1.78 ERA on the mound and hit .323 at the plate. Hunter Traenkle, Division, 3B/RHP, Sr. He hit .365 with 26 RBIs and 21 runs as a junior. Brendan Turton, Clarke, RHP, Sr.
Turton is committed to Dominican College and went 5-2 with a 1.79 ERA with 49 strikeouts in 47 innings last season. Alex Ungar, Connetquot, SS/RHP, Jr.
Hit .382 with 12 RBIs while allowing just three runs in 33 innings on the mound. Gino Vano, Babylon, LHP/1B, Sr. Struck out 38 batters in 39 innings and had a 3.77 ERA last season. Andrew Veit, Bellport, SS/RHP, Sr.
Rich Vento, Carle Place, LHP/1B, Sr. He hit .438 with a .526 OBP, 17 RBIs and 2-1 record last season. AJ Verga, Floyd, LHP/OF, Sr.
Hit .289 and had a 3.99 ERA last season. Committed to Molloy. 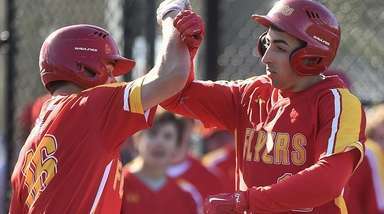 Don Willie, Sachem East, C, Jr.
Batted .450 with a home run and 16 RBI as a junior. Committed to Fordham. Joe Wozny, Stony Brook, RHP, Jr.
Had a 5-1 record with a 1.52 ERA and struck out 121 in 59.2 innings. Committed to UConn. Derek Yalon, Connetquot, OF/RHP, Sr. Three-year starter with power to all fields. Stony Brook commit. Jared Yalon, Connetquot, 1B, Sr.
Lefthanded power hitter, who hit .377 as a junior. Stony Brook commit.